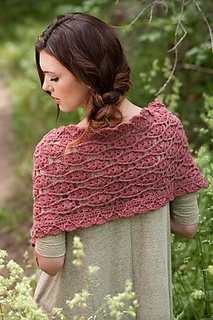 Post stitches define a standard shell stitch pattern to create a textured scarf that can double as a shawl in a pinch. Add pop and dimension to any wardrobe. Finished Size: 55” long by 12”wide. Yarn: Green Mountain Spinnery Alpaca Elegance (50% New England alpaca, 50% fine wool; 180 yd 165 m/2 oz 58 g; CYCA #3):#7565 hibiscus, 4 hanks. Hook Size: 7 (4.5 mm). Adjust hook size if necessary to obtain correct gauge. Notions: Blocking pins; spray bottle; yarn needle. Gauge: 2 patt reps by 8 rows = 4¼“ square.